"It's so easy to laugh. It's so easy to hate. It takes strength to be gentle and kind." 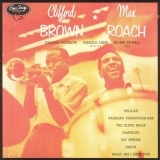 Sorry, no matches on eBay for "Parisian Thoroughfare Clifford Brown And Max Roach".